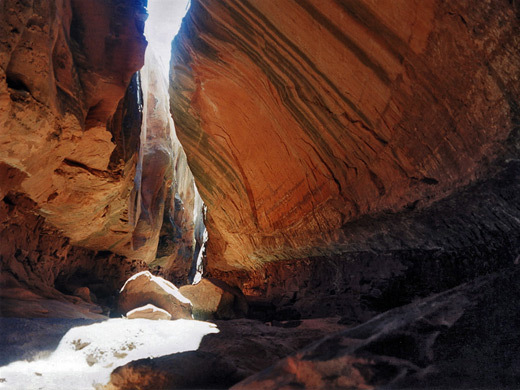 In terms of narrowness, Brimstone Gulch may be the ultimate slot canyon - less than three feet wide for much of its one mile length, the central section is not traversable at floor level, being in many places just a few inches across but still dozens of feet deep. The passages are dimly lit with curving walls that block most sunlight and have quite dark-colored rocks, all of which make the canyon very ghostly and mysterious. It also usually has pools several feet deep along the lower end, requires a rather longer walk to each than the other two popular tributaries of Dry Fork Coyote Gulch (Spooky and Peekaboo) and so is visited much less often. Exploring from the top end is an alternative, though this involves a long walk over the sandy desert, and again only a short part is easily accessible before the canyon narrows. Risks are greater this section owing to the possibility of descending a dryfall but being unable to climb back up, as witnessed by one hiker who was trapped here for eight days (in 1996). Brimstone Gulch joins the larger Dry Fork of Coyote Gulch from the north, about 2 miles east of the usual entrance to that canyon. The walk down Dry Fork is easy apart from one potential obstacle formed by a chokestone and 15 foot dryfall, which can be free climbed, though flash floods sometimes partially remove this obstruction. At the junction Brimstone is unremarkable - a flat floor of soft sand between widely separated walls of orange-colored Navajo sandstone. The narrows start abruptly after one mile. 5 views of Brimstone Gulch. TopoQuest topographic map of Brimstone Gulch. The canyon is deep from the beginning, and often contains a few muddy pools near the entrance after which the passageway is dry for a while. The walls become as little as 2 feet apart and the rocks above curve inwards preventing all but occasional rays of sunlight from illuminating the way ahead. 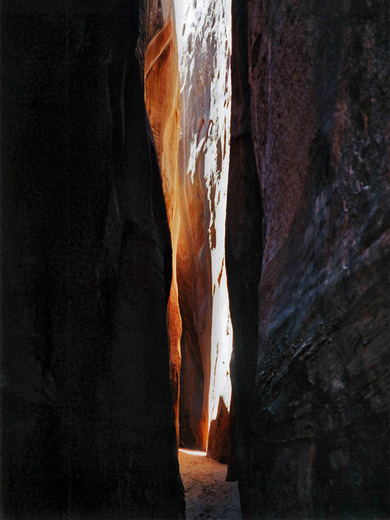 In a particularly narrow and gloomy section there is likely to be a long, thin pool of cold water, 5 feet deep or more, that curves around several bends in the canyon but apart from this there are no major obstacles before a temporarily wider, shallower and more brightly lit section filled with fallen rocks - a subway-like chamber that often harbors one or more small rattlesnakes. These creatures are frequently found in canyons in this region, and are usually the midget faded species, a regional variation of the western rattlesnake; pale yellow in color without any distinctive patterns. Beyond the open area, the gulch deepens again and soon becomes too narrow to continue at ground level - the passageway is about 6 inches wide and offers no easy way to climb above the tight section, so returning back to the entrance is the only option for most people. This turn-around point is reached about 20 minutes hiking in the narrows. The lengthy central section of Brimstone Gulch can best be traversed starting from the upper end, by use of chimneying techniques up to ten feet above the floor, and a number of small rappels.